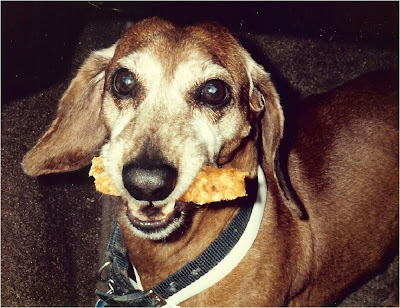 Our first dachshund Digger was always a spry little fellow, robust even in his old age when I knew him and all we really worried about we minor health concerns in the grand scheme of things. Bad breath, an occasional ear infection, the mysterious bulge in his cheek which we thought might be a tooth problem but proved at the vet's office to be nothing more than his secret squirrel food pack. And this, the little nubby dry end of his tail that sometimes needed a little TLC when Digger's happy tailthwacking into walls and legs and furniture disturbed the tiny scabs on the relatively bald tipped end of his tail. Digger's follicle challenged tail tip was a reminder of an earlier incident in his youth when his tail wasn't fast enough for the closing door. I am told that not soon after it happened, swelling caused the hairs on the tippy tip of his hurting tail to poofter out and then the hair on the last inch or so of his tail grew sparsely after that, but I suspect Digger's pain long subsided before that of his dad. Nobody likes to see a dog in pain, much less be the cause of it. The stairs, I think, must be every doxie's little Mount Everest. 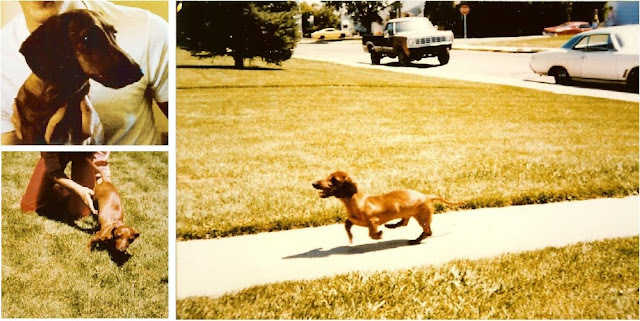 Something to be feared yet respected, and something that often ends up playing a role in every dachshund's story at one time or another in his or her life. Stairs for our first dachshund Digger weren't particularly a problem in the time that I knew him, but one ill timed jump while playing at the top of the stairs, and we watched him slide down the entire run of carpeted steps in our townhome like a little log being sent downriver. Our hearts skipped many a beat watching him slide helplessly away from us, but luckily, pride was the only thing that was hurt that day. It was that very event that helped us recognize the benefits of having a stairwell landing in our next home, so even if a doxie tumbled, they would never have very far to fall. Stairs were something very new to pups Kep and Padua when we brought them home to our apartment. Barely long enough to reach the top of each step on their tiny tippy toed paws, both boys quickly learned how to climb up the outdoor stairs to our second floor temporary abode, but downstairs was a different matter. Fearless Kep learned how to galump downstairs as quickly as he did up, but sweet Padua needed a little guidance from Big Boyfriend, who taught him step by step, paw by paw, til finally puppy Padua built up the courage and rhythm needed to conquer the big scary stairs. And soon, by the time we moved into the house we now live in, the boys would race up and down the stairs, often skipping a step or two in their never ending quest to best one another. Baxter, knock on wood, has yet to make his own stair story. Going up and down the stairs by himself is something we usually discourage tiny chumley from doing, but sometimes the little kielbasa is just too fast for us to catch and carry, especially after he's been home alone and he's anxious to account for everyone's return. Darting out of the bedroom and blasting down like a porpoising rocket to greet everyone, and then rounding back up to get his kong toy to finish up the last of its peanut buttery goodness. Even skipping a step or two in the process, like his brothers before him. sorry, no time to waste. can i take a raincheck for the stair rideys? cuz i've totally got places to go and things to do! A tiny picnic lunch for the little kielbasa, his small reward for being such a patient little boy waiting inside while I bubble, bubble, toiled and troubled my way through another science sunday on the deck, making tags for precious Annie and irresistible Ike. It's not very often really that I see Baxter reared up on his hind legs. By default, it seems our little boy is perfectly happy staying horizontal, save for the times when he's spied a squirrel in a tree. 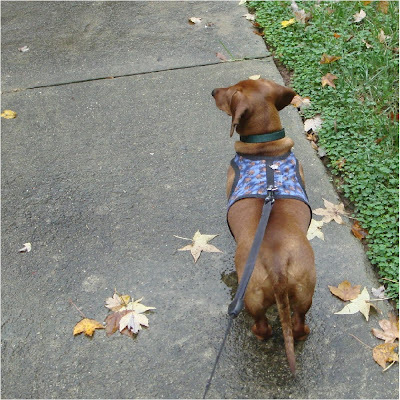 And that suits me just fine, when I think of all the trouble a little doxie can get into, just by rearing up on his stubby hindquarters. Digger, and the case of the missing porkchop. Kep, who could sit up on his hindquarters for hours if he wanted to, and the time he hurt his back trying, we think, to climb out of his confined space in the kitchen. The knee high world. The level at which many a doxie might lose his way amongst all those lovely temptations, but I can only hope for tiny chumley, just a happy place to get an occasional picnic lunch. Whew. 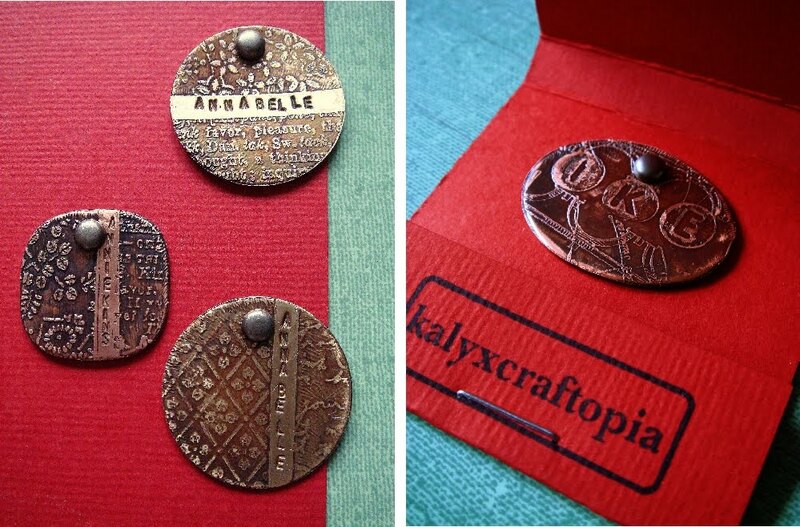 Something finally back in the Kalyxcraftopia Etsy shop. To be quite honest I had carved these print blocks years ago, and sent hand blocked prints out in two successive years as Valentine's Day gifts for family and friends. First came Cupid's Helper, based loosely on my remembrance of Digger's old man snoozy habits, a classic pose that I catch Baxter doing even today as a youngster. Second came Duo, which reminds me of Kep and Padua when they were puppies and were learning how to climb up and down stairs. We showed them, step by step and paw by paw, what to do. 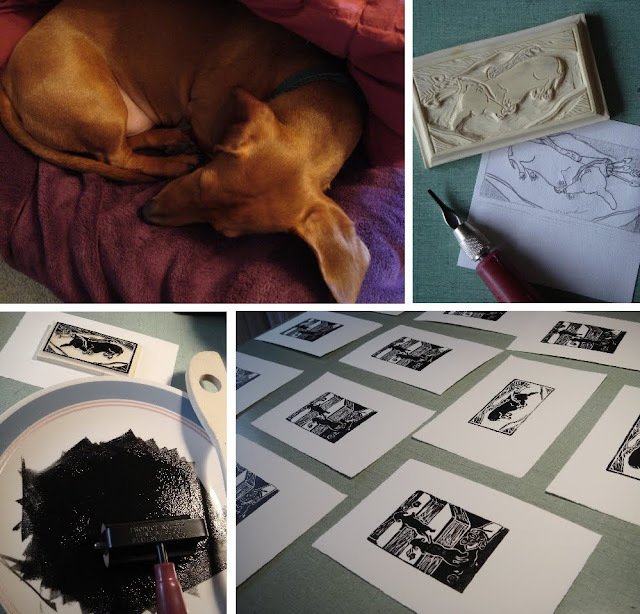 Time helped me forget how long it actually takes to make a print with roller and ink, a process which takes much longer than entrusting it to technology. But nothing can replace the wonderful imperfections of handwork, and so yesterday afternoon I reminded myself why it is I don't make a billion prints at a time. 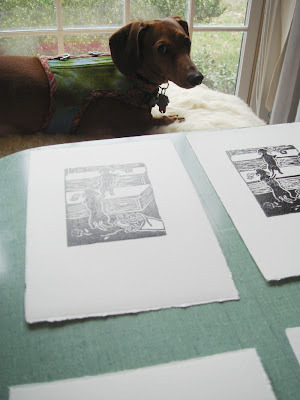 Tiny chumley lurked about while I rolled and spooned and peeled and waited for ink to dry. He sat atop his kitty perch, watching for squirrels and listening to the strange sound of ink squishing about, all while basking on the cozy warmth of his sheepskin and in the comfort of his cashmere lined harness, an experiment to test cashmere's warmth and durability as a lining. I have a feeling he's going to need all the warmth he can muster tomorrow. The snow started to fall in the early evening, and it has yet to stop. Tomorrow, possibly a lazy day, but otherwise, work on Molly's second harness. And maybe another addition to Etsy. Yippee!!! Day 6 so mom is coming home today. But I digress. It's me, Baxter, your roving rover reporter reporting to you today from my walkies. But don't worry if you already went to the bathroom cuz I'm not a marker either. There will still be plenty for us to do. I brought along another one of my mom's stories for us to read. "This is the Digger I met and have always known, the little brown dog with white face and paws and a baritone bark. A manly little dog, made even more so because he was, ahem, still very endowed. Digger's life as a little senior dog was uncomplicated, just the way he liked it. When he would wander out back in his tiny fenced yard, he would walk the perimeter carefully, sniffing at Molly the Golden Retriever on one side, and, having confirmed that she was there, continue walking his beat in circles until he felt it was time to come inside, at which point he would let out a single chesty bark by the door. Digger must have liked orbiting. When dad would stretch out on the floor, Digger would orbit him just as he did his backyard, trundling about with his tail wagging happily. 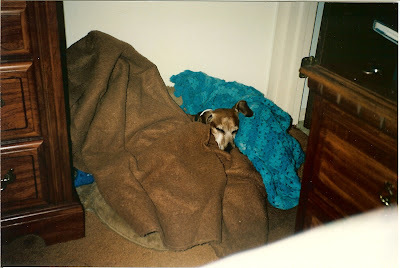 Although Digger was very spry for his age, by the time his dad and I were engaged, Digger would often set his own bedtime and wander upstairs on his own to turn in for the night in his little bed. There were other things, we would find out, that he probably did in bed. Digger's cheeks would occasionally swell and we thought for sure he might have a dental problem and took him to the vet. But to our surprise, the vet didn't find signs of dental infection. He found kibble. Little food packs. Evidence, of Digger's inadvertent but serendipitous method of eating, the mechanics of which somehow trapped food in hamster-like fashion between his back teeth and inner cheek. Our first boy with his chipmunky jowls had become a hamster in his old age, squirreling away snacks to nibble at his leisure in the comfort of his own bed. " Hey whazit mean to be endowed? Duk Duk said it is when somebody or an institution is given money for a specific purpose. Do you think whoever endowed him could endow me so I could buy some rawhide? Anyway, this is Baxter your roving rover reporter reporting to you now from my home. Thanks for keeping me company while my mom was gone!!! Me again, Baxter your roving rover reporter, reporting to you from my house cuz I am still grounded. Today was lookin like it was gonna be the pits but then I found these picture albums. 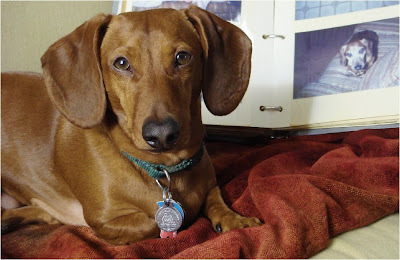 And guess what I found for us to read - the second part to Mom's story about Digger, mom n dad's first doxie. U wanna read it with me? "This is the Digger I never knew, a young wiggly puppy who grew into a lad that ultimately kept my future husband company when they both lived in a drafty room above a sandwich shop, pursuing his master's degree in a field he no longer practices. Digger's dad, that is, not Digger. During the frigid cold days of winter, Digger would burrow under his blankies and snoooze the day away deep in the bowels of his blanket igloo, patiently awaiting dad's return from a long day of scholastic endeavors. Patiently, but with a dash of howling that could be sometimes heard in the shop below. In addition to being a howler, Digger, apparently, was a digger, though he had apparently given up that skill by the time I came on the scene. I missed out on the dirt mounds and dirty paws, missed out on the time when my husband-that-I-didn't-know-yet chided poor Digs for constantly whining and digging by the deck at the townhouse, til finally it was discovered that the source of Digger's interest was indeed a rat and the nest it had made under the deck. This boy was on a mission, and neither chiding nor dirt were going to hinder this hound from getting his quarry. There aren't many pictures of this time in Digger's life. The rat incident came some years after this picture was taken, during, I presume, what I like to call his ready-for-roasting years. Every doxie, it seems, goes through his butterball moments in life. Though some, earlier than others." Whoopsie. Is that me?? I guess I was kinda jiggly when I first came into mom and dad's home. Keep me company again tomorrow, will you? 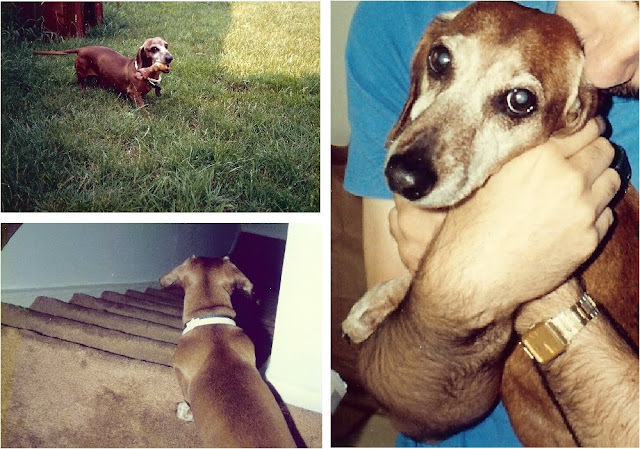 It occurred to me that we have no digital pictures of our first dachshund, Digger. I met Digger when he was already an old man, gray faced but still full of life despite the tiny ridge of spine that was already starting to make itself more prominent. He was very spy for his age, though I would not realize this til Kep and Padua reached their own less robust senior years. The old man that Digger was, I hope Baxter will be. 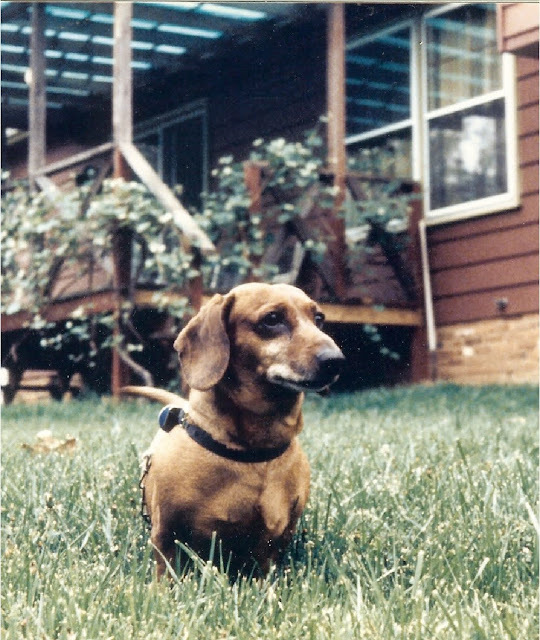 Little DigDog was my first introduction to doxies. I wasn't sure what to make of him, being so low to the ground. He was hard to pet, I remember thinking at first. But nevertheless he was a sweet dog and there was something so easygoing and familiar about his owner that I was sure I would be seeing him again. Digger. And his owner. Who is now Baxter's dad. As Digger's owner and I started building a relationship, Digger tagged along on our journeys. We would go for walks, with Digger happily trundling about despite the fact that he would misjudge where the curbs were because of cataracts in his eyes, and he would end up jumping not once but twice to get up on the curb, the first time way in advance of the curb so all he did really was just jump for the sake of jumping, not that that was at all what he wanted to do. But Digger was a happy go lucky kind of fella and he took his double jump curb hopping in stride. Just like he did sleeping so hard that his little pink tongue would inevitably peek out of his mouth and he'd eventually have to wake up to remoisten things. When we journeyed to places where we couldn't bring Digger, and friends couldn't drop in at the townhouse to check on him, we would deposit Digger at the kennel. Being small and older, Digger would be kept in a quiet, small space in the cat section, a humiliation we never really got to see in person though we imagine he ultimately handled himself well. Digger always seemed to have lost weight when we picked him up at the kennel, and he was of course, quite standoffish on the ride home, choosing to stick his nose near the car's floor vent rather than tell us about his stay. 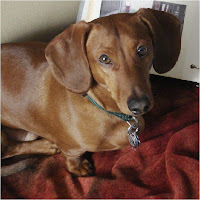 When we mentioned on a subsequent visit to the kennel about Digger's weight loss, the kindly folks switched him to canned food and suddenly things changed from picking up a svelte doxie to a picking up a newly fattened piglet. Digger became very happy about the notion of going to the kennel once canned food came into the picture. There is more to Digger's story, but I'll save it for another day, when I've finally gotten around to scanning some of our favorite images of our first little red. Today, the best I've got is to show you is this, a dusty crafty retro rewind from 1996, when I first messed with polymer clay and first attempted to immortalize our first doxie, white paws and all. Of course no day is complete without a bit of Baxter to brighten things up. It is still night as I write this post, with Baxter snuggled by George while he sleeps atop his cozy sheepskin. I didn't mean for these photos to be quite so similar in pose but I see now that they are. Life imitating art, I suppose.